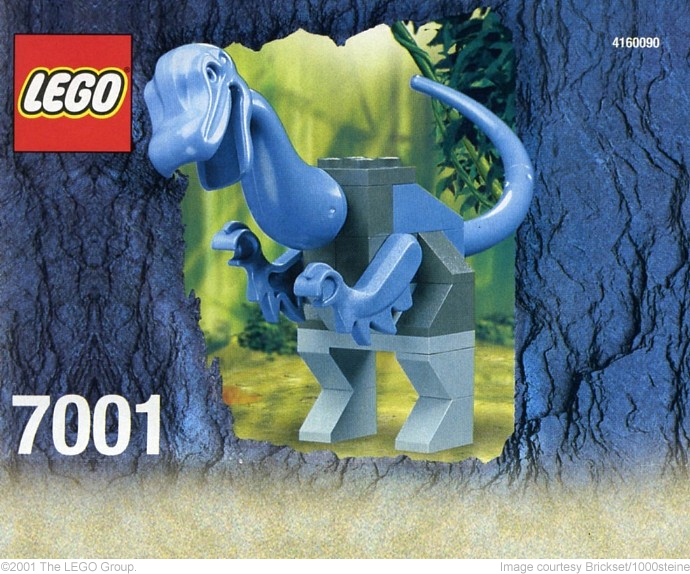 Sand Blue first appeared in 2001 in the Life on Mars theme and the rather terrifying Dinosaurs theme (terrifying not because they were dinosaurs but because of the models with their PooP heads). But the colour fizzled out in 2006, presumably a victim of TLG massively cutting back their element inventory in light of the company’s financial woes. It has only been used for minifig parts since then, with a notable exception in 2011; the Modular set 10218 Pet Shop had four kinds of Sand Blue bricks in impressive quantities (averagely 50 of each). There is another exception from that same year actually; 10223 Kingdoms Joust had 14 1X2 bricks with groove, but that’s it – it’s just been minifig parts – until 2014. Already, there are 11 non-minifig elements listed in this year’s sets and they appear across three themes, which gives me hope this isn’t just a temporary resurgence for the colour. Sand Blue features in one Maersk set, two Star Wars sets and is the colour of the new Rhino tribe in Legends of Chima. The behemoth that is 10241 Maersk Line Triple-E is packed with interesting new elements that I'm bound to mention in the coming weeks. Its Sand Blue offering are three very basic and useful 2X4 parts: the brick, the plate and the tile. These are used amongst the massive cargo being carried by the ship; consequently you get good quantities. There are 44 2X4 bricks (Element ID 6052830 | Design ID 3001) which is superb news, as back in 2003-4 this element only came in quantities of one or two in the five sets that it was included in. You get 28 2X4 plates (Element ID 6052827 | Design ID 3020), which came in seven sets from 2002-4 and the best quantity back then was just eight (provided in 4508 Titan XP). As for the 2X4 tile (Element ID 6052832 | Design ID 87079), that’s never been seen in Sand Blue before as the part was only introduced in 2010. This set has 14. 75041 Vulture Droid has just three sloped parts but they’re large, prominent and have never been seen in Sand Blue before. 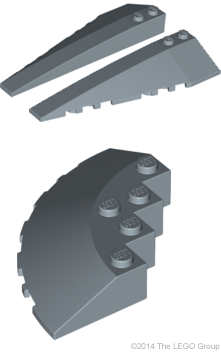 There’s the pair of curved 10X3 wedge bricks so beloved by many spaceship builders (left wedge Element ID 6056667 | Design ID 50955; right wedge Element ID 6056669 | Design ID 50956), of which you get four of each. There are two of the 6X6 quarter-circle 33⁰ slopes (Element ID 6056672 | Design ID 95188) that first appeared in the Alien Conquest theme in 2011. Admittedly it's not the most useful part but given that regular 33⁰ slopes have been available in Sand Blue since the time of the Dinosaurs, there's potential here - also, there's a 3X3 corner 33⁰ slope available, released in one set (4745 Blue Eagle vs. Snow Crawler) in 2004. And although they’re not Sand Blue, I can’t resist going off-topic and mentioning these adorable printed 2X2 domes (Element ID 6058942 | Design ID 16378) that also come in the set (as well as in 75044 Droid Tri-Fighter). 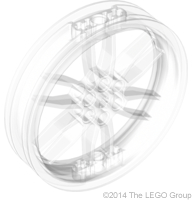 Moving on to 75040 General Grievous' Wheel Bike, I'll remain off-topic for a moment because it contains a gorgeous, massive 75mm wheel in Trans-Clear [BL]/Transparent [TLG] (Element ID 6053875 | Design ID 88517). What a gorgeous thing! It looks great in the set and I hope to see some great use of it in MOCs too. But back onto Sand Blue now, and the exciting news is that you get 16 cheese slopes (Element ID 6062686 | Design ID 54200) which we've never had in Sand Blue before. Cheese is a great part to get in new colours, as it's a detailing part that doesn't always require a whole lot of other bricks in the same colour to look good in a model - for example, these Sand blue ones can be used with a variety of other shades of blue in your models of water. The other Sand Blue part isn't new, having appeared in three sets in 2004-5, but good to see it back: the 3X3 corner wedge plate (Element ID 6051596 | Design ID 2450), of which you get two. 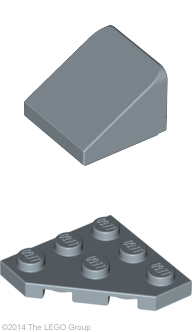 You also get two of those 3X3 corner wedge plates in 70131 Rogon's Rock Flinger , where the Rhino minifigs are Sand Blue. There's four 2X2X2 65° slopes (Element ID 6043736 | Design ID 3678) which is kind of new - this element has appeared with printing in Lord of the Rings 79006 The Council of Elrond, as Arwen's dress. Another sloped piece included are the two 4X4 triple wedge 18°/45° slopes (Element ID 6051598 | Design ID 48933). And finally there's an odd part; two curved Technic panels (Element ID 6051594 | Design ID 61069) that look like intake fans. I'm not a huge fan of Technic panels, but this one is quite cool. (Sorry.) These have been around since 2008 and have appeared in 15 other sets in 6 other colours. So hopefully more Rhino sets are on the way, with yet more Sand Blue for us! But already these new parts, combined with the hundreds released in the 2000s, offer great building opportunities. If you own Pet Shop and the Triple-E, you've got a fantastic amount of basic bricks. You're also fairly rich/good at spending money wisely. The Star Wars and Chima sets add yet more slopes to the existing inventory of 33°, 45° and 75° slopes, and the more unusual Sand Blue shapes in these sets are rousing my inner Benny... "Spaceship!!" To help rouse your inner Benny, here's a stunning ship built by Daniel García Rodado (AlterEvo) in 2011 with some of the Sand Blue parts available then. It reminds me of an egg, or an artichoke. Click pic for more views. How dare you slander the Dinosaurs sets! Honestly, I don't see how they are at all worthy of criticism for any reason other than some of the models not looking quite accurate to the dinosaurs they were meant to portray. The idea that the heads are POOPs is absurd — specially-sculpted head and body molds have been standard for LEGO animals since 1984 when the LEGO horse was introduced, and the dinosaurs' head and body molds are among the least specialized ones there have ever been. In fact, they actually replaced the much more specialized dinosaur designs from the Adventurers Dino Island subtheme. Oftentimes when I see creatures like the new Dewback in this summer's LEGO Star Wars sets, I miss the days of these LEGO Dinosaurs, which despite their specialization featured some of the most versatile creature-specific molds of all time. Nowadays, it's normal for new molds to be introduced for each and every creature, and that's what it was like before the LEGO Dinosaurs too. But those sets' parts went on to be used for elephants, the dewback from Star Wars, the Basilisk from Harry Potter, and all sorts of more elaborate brick-built creatures, not to mention over a dozen dinosaur designs. These are sets that should be praised, not criticized. Anyway, I guess despite all my knowledge of LEGO colors, I never really thought of Sand Blue as having disappeared in any capacity. Of course, part of this is that the only time I tend to differentiate between basic building elements and other parts is when I'm looking at a color's overall availability, not its availability in any given year. Now that I realize just how scarce Sand Blue has been for the past several years, it's great to see it back in such variety. 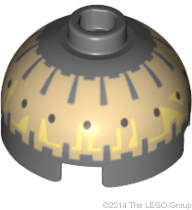 One correction: the General Grievous minifigure doesn't actually include any new molds. All five of the molds were previously used (albeit with different painting/printing) for the Clone Wars version of the character. Haha, a well-fought defence. True, not technically POOP. I was intending to convey the contrast between the detailed head/limbs and the blocky body in these small sets, which looks so absurd. Thanks for the Grievous correction. I only cross-checked against IDs; should have checked by name. Have amended. Am i the only one thinking there are too many shades of blue? Sure it gives lots of choices but it also fragment the bricks, and you're less likely to have enought parts of a specific color to build something. Unless you are rich and have huge quantity of LEGO. Yeah, that's sort of my opinion as well. I played with Lego a lot as a kid, back when it was pretty much only red, black, white, blue and yellow, with green only being for plates, flower stems and trees. I've gotten back into Lego in the past couple of years, and while I love the assortment of colors, I also find that I can't really build anything, despite having more Legos than I did as a kid. I certainly don't want to go all the way back to where it was. I feel like Lego needs to focus on a a palette of 12-15 colors. Right now, things are just too split up. I have like 40 colors of bricks. I think that depends on what sets you are buying. "Bricks and More" are mostly standard bricks in standard colors, as well as "Creator". Those sets also often have a smaller price per piece ratio. I'm more annoyed by how supposedly same colors often differ in hue for various reasons. I don't think you could have a very complete color palette with any fewer than 16 colors. That's enough to include black, white, red, orange, yellow, blue, green, and violet, plus transparent counterparts for all of the above. If you want a single shade of gray, that makes 17. Silver and gold make 19. And what about other colors Western culture considers "distinct" from the main rainbow colors? Things like brown (a shade of orange), tan (a tone of yellow), or pink (a tint of reddish violet)? That makes 22 colors. Transparent pink? 23. An orangish tint for light-skinned licensed figs so they don't look either spray-tanned or pallid and zombie-like? 24. So yes, the color palette could be smaller. But make it much smaller than 24 and you'd be left with a selection that is quite visibly incomplete to pretty much any child who owns a 24-pack of crayons or colored pencils (and one that, unlike crayons or colored pencils, doesn't allow any mechanism for "blending" colors to create the ones that are missing). Beyond that, you'd have no tertiary colors except for pink (which is, as I mentioned, a tint of reddish-violet). If you did have tertiary colors like bright yellowish-green, bright bluish-green, and bright reddish-violet instead of just primary and secondary colors, you'd add six more colors to the palette, resulting in a palette that is almost exactly half the size of the current one. Keep in mind that even way back in the day when LEGO sets included non-brick-built model cars to go with the brick-built structures, there were a wide variety of colors being used for these non-brick-based elements. Part of the reason why certain colors were not widely used for bricks was to exert a sort of ideological control over what kids would build — the LEGO Group worried that if a wide range of grey, green, or tan bricks were available kids would start trying to build military vehicles and models, which was against LEGO's staunchly anti-war values at the time. To be honest, I really love how today, colors are more widely used across a wider range of themes, instead of certain colors being super-rare and obscure (two years ago, many people mistook Bright Green, a color that's now been around for over two decades, for a new color, and some colors from themes like Fabuland were NEVER used for basic bricks). Of course, I grew up in an era where the color palette was sprawling out of control, with dozens of colors that were used in only a handful of sets within very specific themes. So a palette of about 62 main colors (40 solid, 14 transparent, and about 8 metallic), which are actually used widely enough to be familiar to people, is a godsend for me. One might claim that green and grey was used by Lego from early on (50's-60's), but just as baseplates, not as bricks, and thus, it was a deliberate choice not to produce bricks in those colors - but there's research showing that Lego experimented with bricks in a multitude of various colors, even by then, so it's not really a valid argument. ¤ Blue, Dark Blue, Medium blue, Medium azure, Dark Azure, Sand blue, Bright light blue. Including Nougat or Dark orange in the red spectrum would be wrong, they're oranges, not reds. To do that you'd have to include the purples in the blue spectrum too. They need to bring back sand red or something similar. Light red would essentially be pink, and there's a few pink/magenta colors. "a gorgeous, massive 75mm wheel in Trans-Clear [BL]/Transparent [TLG] (Element ID 6053875 | Design ID 88517). What a gorgeous thing! 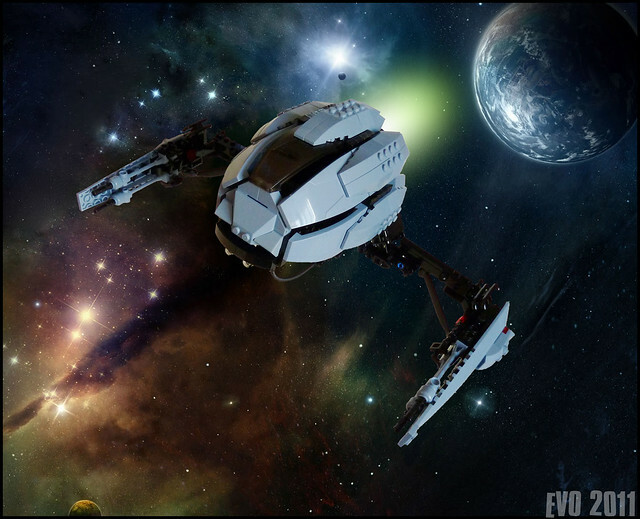 It looks great in the set and I hope to see some great use of it in MOCs too." I appreciate sand blue as it makes a nice transition between light bley and medium blue. Sort of the missing link as it were in color evolution. AHHHH That trans clear wheel is glorious. Considering I've used that rim(with tire) on two MOCs I can definitely see some uses for it, tron light cycle inspired MOC perhaps? I always liked the sand colors, wish they'd use them more. Glad to see Sand Blue is making a comeback.